First let me state up front that I am not a big Jello fan. My mother used to make a Jello mold with lime Jello for family gatherings. It was called “the green mold” and you can imagine what fun our pre-adolescent (what the heck, even our adult) minds had with that. But I bought a bottle of apple-grape juice (I’m also not a big fan of grape juice) and discovered I didn’t like it. I usually mix my juice with sparkling water to make a spritzer, and the grape flavor didn’t mix well with the sparkling water. On the other hand, I couldn’t bear to pour a whole bottle of juice down the drain. Today was a use-up-leftovers-so-I-can-clean-the-fridge day, so I figured I needed to dream up a way to use the juice. Jelled dishes made with unflavored gelatin are not nearly as obnoxious as those made with flavored Jello mix. In fact, there are a number of admirable gelatin-based aspics and vegetable salads that would be lovely on any buffet table. I decided to make something jelled that I could take for dessert or a snack with lunch. The basics of working with gelatin are that one tablespoon of gelatin will jell 2 cups of liquid and, if you want, 1-2 cups of fruit/vegetables. Sour cream or yogurt count as liquids. You have to soften powdered gelatin (the kind that comes in little packets) in cold water for about 5 minutes, then heat or add to hot liquid to dissolve it. Don’t let it boil – that kind of takes the jelling power out if it. Fresh pineapple can also keep it from jelling. Put in refrigerator for 2-3 hours or until it jells. If you want to unmold the jelled dessert, you can dip the bowl briefly in hot water and overturn it onto a plate. Since I am just using this as a take along for lunch, I opted to just scoop servings from the bowl. This makes about 6 serving with 0 grams of fat/serving. Variation: I expect you can put any kind of canned or cooked fruit in this, such as fruit cocktail or mandarin oranges. 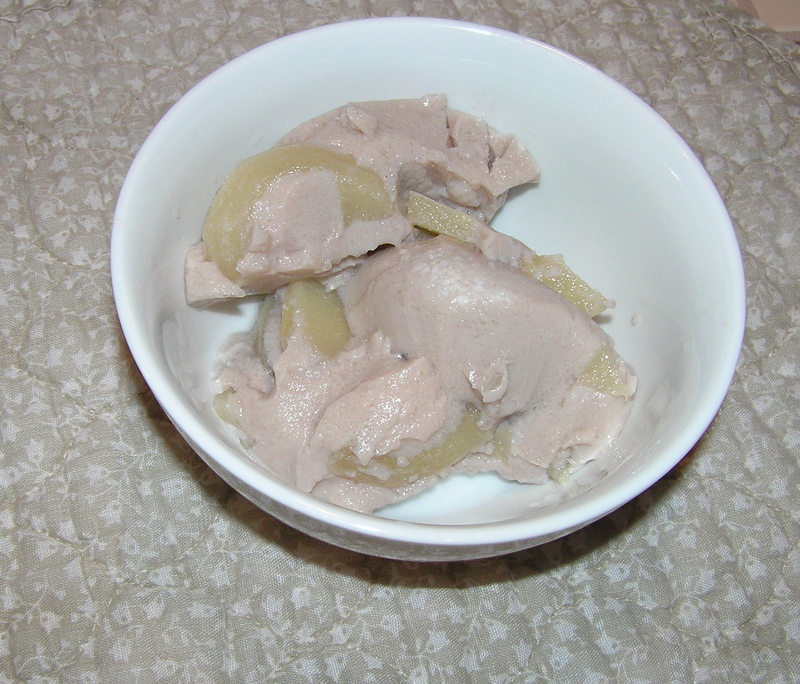 This was not the most attractive jelled dessert, but it did use up a lot of odds and ends – and it tasted good.